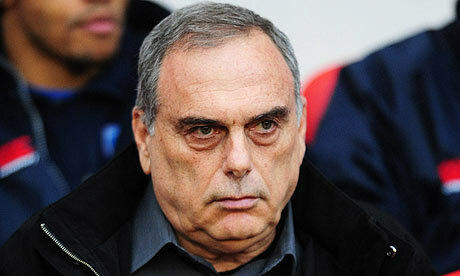 Avram Grant has taken many pundits by surprise by joining Serbian champions Partizan Belgrade as coach from today. With fifteen games played so far this season in the Jelen SuperLiga, Partizan have a ten point lead over arch rivals Crvena Zvezda and already look set to continue their recent dominance by winning a fifth consecutive title. Because of this it was all the more surprising to see ousted coach Aleksandar Stanojević have to depart his post which he had occupied since 2010 and had helped win two league titles, one Serbian Cup and helped the team reach the UEFA Champions League in the 2010-11 season. However it seems that there had been some internal politics at the club which had forced the board to sack Stanojević and appoint Grant who, after a little more than four years in England, was at the point where he was seeking a new challenge. It was only at the end of the 2010-11 season when Grant lost his job at English club West Ham United after he failed to prevent the London club from getting relegated to the Championship (second tier). New England Revolution’s attempts at winning the North American SuperLiga title for a second time were dashed on Wednesday as they were defeated at home by Mexican opponents Monarcas Morelia by two goals to one in front of a disappointing 10,000 crowd. The Revs had previously won the competition two years earlier having beaten compatriots Houston Dynamo in a penalty shoot-out but any repeat of that triumph was put to the sword after Morelia left the American hosts with too much to do after taking a two goal lead in this game. Miguel Sabah scored midway through the second half from the penalty spot after Colombian striker Luis Gabriel Rey was brought down by New England’s Darrius Barnes. Ten minutes later Monarcas had doubled their lead thanks once again to Sabah whose beautiful left-footed volley gave keeper Matt Reis no chance. New England reduced the arrears in the 79th minute after Kevin Alston calmly slotted the ball home to provide the game with a grandstand finish but Morelia held out to win their maiden title and increase Mexico’s lead over the United States in terms of titles to 3-1. Mexican side Tigres UNAL lifted the SuperLiga title in 2009. Who will win it in 2010? New England Revolution, 2008 winners of this event, have qualified for their second final after beating Mexican side Puebla F.C. in a penalty shoot-out after their semi-final contest finished 1-1 after 90 minutes. The Revolution qualified for the semi-finals after finishing top of Group B with a 100% record over Morelia, Chicago Fire and UNAM Pumas and had the home draw against their Mexican opponents, who finished second behind Houston Dynamo in Group A. Kenny Mansally gave the Revs the lead after 56 minutes but the New England outfit were made to pay the price just two minutes later when Nicolás Olivera equalized for Puebla to restore parity so soon after going behind. With no further scoring in the ninety minutes the match went straight into a penalty shoot-out and each team were equal to each other until they took their fourth penalty with the Revs having the advantage once Edgar Lugo hit his kick straight at keeper Matt Reis. Kenny Mansally scored the winning penalty to take former Liverpool man Steve Nicol’s team into their second SuperLiga final. The second semi-final was played between Houston Dynamo, who finished top of group A with two wins and a draw from three games, and Morelia. The Mexicans went through courtesy of a goal just two minutes into the second half after Miguel Sabah coolly finished to give his side a 1-0 lead which they never relinquished. It sets up the third America v Mexico final in the tournament’s four year history with only the 2009 final being an all-American affair. The final takes place in late August and will be hosted at the Gillette Stadium in Foxborough, the home of the New England Revolution. The new Danish Superliga begins this weekend and many people will be wondering if there is anybody who can stop FC København (FCK) from claiming another championship. The capital club, formed as recently as 1992 due to a merger between traditional clubs KB Copenhagen and B1903, have won the championship eight times in their history but it is in the last decade where they have maintained a stranglehold of domestic dominance winning the title seven times since 2001 including four of the last five championships, only AaB Aalborg interrupting their run in the 2007-08 season. Can coach Ståle Solbakken keep the title at Parken Stadion or will one of the other teams finally achieve some league glory of their own? The league programme kicks off on Saturday in Odense where local club OB, runners up for the last two seasons, will meet Esbjerg fB with the home side most people’s tip to be the team that can end FCK dominance. With former Manchester United players Roy Carroll and Eric Djemba-Djemba, last season’s top scorer Peter Utaka and former AC Milan star Thomas Helveg in the team there is plenty of experience for De Stribede who are an ambitious club but have been starved of success in recent years save for a couple of Danish Cup triumphs in 2002 and 2009. However it is a first league title since 1989 that the third-city club are craving whilst their opponents Esbjerg last won the title over thirty years ago and finished a respectable fourth place last season but were a distant eighteen points behind the champions in the process. Before FCK came along there was only one team in Denmark who were well known outside of their home country and that was Brøndby IF. The club who gave the world such great players as Peter Schmeichel, Kim Vilfort and the Laudrup brothers have been, by their own high standards, unsuccessful since they achieved the Danish league and cup double in the 2004-05 season. With only the Danish Cup of 2007-08 to show for their efforts since many feel it’s about time that Brøndby IF supplied a major title challenge again and having finished in third place last season they will hope to start this time around with a good win over Randers FC, a small club from northern Jutland who survived in the Superliga by the skin of their teeth having finished just a mere two points ahead of relegated Aarhus GF. As for the champions they begin their title defence with an away game at SønderjyskE, a team who have just about survived in the top flight since their promotion from Denmark’s 1st Division in 2007-08. The last two seasons have seen the team from southern Jutland (hence the name) finish in tenth and ninth places and their target for this season will be something along the lines of mid-table security. In Zealand, the island on which the capital Copenhagen is located, FC Nordsjælland will face off against Silkeborg IF with both teams fully aware that there was very little other than goal difference separating the two teams last season although in their head-to-head meetings in the 2009-10 season FCN won two of the three games so will have that little advantage going into today’s game in the city of Farum. The remaining two games in Matchday 1 involve last season’s promoted teams AC Horsens and Lyngby BK. The former went up as last season’s 1st Division champions having pipped the latter to the title by four points. Both teams, who have replaced Aarhus GF and HB Køge in the Superliga, will play against FC Midtjylland and AaB Aalborg respectively upon their return to the top flight. AC Horsens, back in the Superliga after just one season away, will play their first game at home on Sunday whilst Lyngby BK will complete the round of games upon facing the 2007-08 champions from Aalborg on Monday night. This weekend could prove to be one of the most crucial in the season in many of Europe’s top leagues. In Italy defending champions Internazionale have been showing the pressure in the last two months and a famous 2-1 win for AS Roma over the Scudetto holders means that the Giallorossi are just one point behind Inter. Elsewhere FC Bayern suffered a shock 2-1 home reverse at the hands of improving VfB Stuttgart whilst in Portugal a crucial 1-0 win has given SL Benfica a six-point cushion over nearest challengers Sporting Braga. The English Premier League saw Manchester United and Chelsea thrash their opponents whilst Arsenal FC conceded a last-minute equalizer to drop two points further behind in the race for the title. There were also crucial matches in Greece and Turkey whilst the championship was decided in Andorra. Serie A has practically been a one-horse race for the last three seasons and it looked like that scenario would continue earlier in the season when Internazionale FC enjoyed an eight point lead after the Milan derby in January. 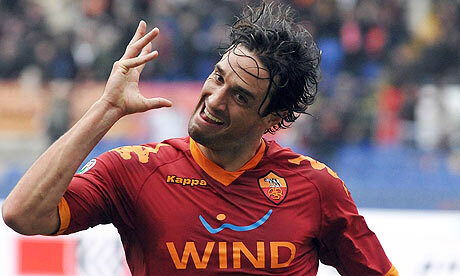 However the Nerazzurri have wobbled a bit since then and their lead is now just a single point from AS Roma after the capital side enjoyed a 2-1 win at the Stadio Olimpico thanks to goals from Daniele de Rossi and Luca Toni, the latter enjoying a personal renaissance since his return to his homeland from FC Bayern. 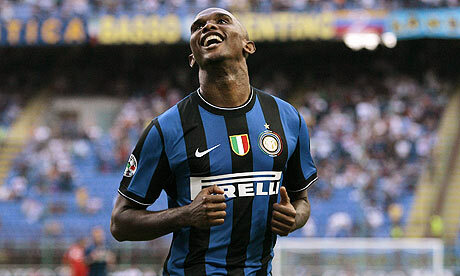 AC Milan, meanwhile, could only manage a home draw against SS Lazio and are three points behind Inter as a result. Marco Borriello gave the Rossoneri the lead from the penalty spot after 18 minutes but it didn’t take long for Lazio to get back on equal terms as Stephan Lichtsteiner restored parity in the 32nd minute to leave Milan frustrated. In the German Bundesliga it looked like service as usual for FC Bayern when Ivica Olić gave the Munich side the lead after 32 minutes but their southern rivals VfB Stuttgart struck goals either side of half-time to leave FC Bayern, who qualified for the German Cup final earlier in the week, visibly stunned. Christian Träsch scored from 24 metres to equalize in the 41st minute and then Ciprian Marica headed home from short range after a beautiful cross to the far post from Cacau to give the Swabians the three points. In the big game at the BayArena home team Bayer 04 Leverkusen lost 2-0 against Schalke 04 to lose further ground behind the top two. Having gone unbeaten in the first 24 matches of the season Leverkusen have now lost three of their last four games. Two goals from Kevin Kuranyi helped to give the side from Gelsenkirchen a two point lead over FC Bayern ahead of the big clash between the top two next Saturday. It was business as usual for Manchester United in the English Premier League as the champions comfortably won 4-0 away at Bolton Wanderers with two of the goals coming from Bulgarian striker Dimitar Berbatov. A Jlloyd Samuel own goal and a late strike from United substitute Darron Gibson kept the Red Devils on top from Chelsea FC who were impressive in their 7-1 demolition of Champions League hopefuls Aston Villa. Frank Lampard scored four goals, including two from the penalty spot, along with goals for in-form Florent Malouda (2) and Solomon Kalou to rout the team from Birmingham whose heavy schedule in recent weeks may be starting to take its toll on Martin O’Neill’s side. Title hopefuls Arsenal FC were just seconds away from an away win at Birmingham City after an 83rd minute goal from substitute Samir Nasri looked to have given The Gunners all three points. However it was another substitute, Kevin Phillips, who would have the final say as his goal two minutes into stoppage time gave The Blues a share of the points and dented Arsenal’s hopes of title glory. Manchester United lead the way with 72 points after 32 games, one ahead of Chelsea and four ahead of Arsenal. In other leagues SL Benfica, fresh from winning the Portuguese League Cup last weekend, now have one hand on the Superliga trophy after defeating second place Sporting Braga 1-0 at home thanks to a goal in the 44th minute from Luisão. The win takes The Eagles six points clear with six games to play and now has Benfica fans dreaming of their team winning a possible treble as they still have a chance of continental glory in the UEFA Europa League. The Turkish Süper Lig continues to fascinate with the top four teams separated by five points with seven matches left to play. Leaders Bursaspor lost 2-1 at Istanbul BB on Friday night leaving it up to the big three to try and catch them. Last season’s champions Beşiktaş had to come from two goals down to beat sixth placed Eskişehirspor 3-2 whilst in the big derby match on Sunday Fenerbahçe beat eternal rivals Galatasaray 1-0 to move into second place three points behind Bursaspor. In Greece Panathinaikos have all but sealed the title having won 3-0 away at Atromitos with top scorer Djibril Cissé amongst the goals. Champions Olympiakos could only draw 0-0 at home to Škoda Xanthi whilst PAOK Thessaloniki conceded a stoppage time goal to lose 2-1 away at Larissa and cannot now possibly catch Pana who have a six point lead over second place Olympiakos with two matches still to play. In Andorra FC Santa Coloma have won the Primero Divisio title for the second time in three years, and fifth title overall, having drawn against local rivals and only challengers UE Santa Coloma 1-1 to win the championship by three points.